This page shows our full range of instruments. Use the 'Instrument type' menu on the right hand side to display specific instrument types. From time to time we high-light an instrument or bow which we consider to be special, regardless of its value. Unique playing qualities or strong investment potential may catch our eye. If at any time you have a special request, like a particular instrument or bow, then please email or phone us with your details. We shall be pleased to do our best for you. A very fine and rare English 'cello by Arthur and John Betts of London, made circa 1830. This unique instrument represents their finest work. It is in an almost mint condition and sold with the certificate of W. E. Hill & Sons, London. We are pleased to offer an exceptional and rare 19th Century 'cello made by the great French and Parisian maker, AUGUSTE SEBASTIAN BERNADEL (known as 'Bernadel Pere'). Instruments of this quality and condition (this 'cello is in a mint condition) appear on the market once in a lifetime, let alone the work of the great Bernadel. The 'cello contains the maker's original printed label at the rue Croix des Petits Champs, Paris, dated 1862, together with the signature of Bernadel on the inner back. Covered in a rich, deep, red-brown varnish, the 'cello has a superb, solo quality tone. (Sold with the certificate of Rampel-Vatelot at Paris, dated 2009). A retired professional violinist has entrusted us with the sale of their fine Italian violin, made circa 1730 by CARLO ANTONIO TESTORE at Milan. This instrument, purchased from J&A Beare of London in the mid 1950s, is in a particularly good condition and represents his best work, with its original purfling on both the back and table. He has used the finest quality wood for the whole of the body. The famous 'C.A.T' brand with double eagle can be seen on the interior back, placed close to the centre, together with the original printed label. A very good Italian violin attributed to and probably by ENRICO POLITI of Rome bearing the maker's printed label. magnificent varnish of a golden-brown colour. The tone is rich and vibrant and with a great carrying power. This violin was the instrument of a professional player for many years. This fine Italian violin, made by a member of the Gagliano family, bears a printed label of Allesandro Gagliano dated 1720. This is a most interesting Neapolitan violin, whose sound holes resemble the work of Allesandro. The fine varnish, typical of the best of the Gagliano family, is a lovely orange- brown colour. The tone of this instrument is of soloist quality. (Certificate of Biddulph, Hanover Square, London). We are immensely proud to offer a unique and highly important violin by the Italian master GIOVANNI BATTISTA ROGERI [1659-1729]. This wonderful instrument has been the property of a distinguished Concert Master of a prestigious European orchestra throughout the last 35 years. Consequently, this violin has appeared in a solo capacity in concertos and recitals in major concert halls throughout the world. Quite apart from a truly magnificent sound, this stunning instrument is in a virtual mint condition and is an astonishingly beautiful work of art. from Max Möller of Amsterdam dated 1980, and J & A Beare of London dated October 2000. The father and son Eugenio and Giulio DEGANI represent the unique Venetian School of making which flourished at the end of the 19th and early 20th Century. Their instruments show a refreshing insight into the individual style of making and design. Nevertheless, there is no compromise for superb craftsmanship and a supreme choice of wood. Giulio DEGANI was born in 1875 and worked with his father for several years, enhancing and sometimes emulating the style of his father's work. 1894 was the beginning of a turning point for Giulio, who won a coveted prize at the Milan exhibition. By 1898 he had taken over the day-to-day running of his father's workshop, but by 1922 had made the decision to emigrate to America, where he remained until his death in 1955. Born in Barcelona, Catalan, Spain in 1702, JOANNES GUILLAMI represents one of the finest of the 18th century Catalan makers. Uniquely individual in the manner of his work, there is often seen, however, the influence of the great Italian maker Guadagnini. The work of this maker continued through his son who was also called "Joannes" (II) who died in Barcelona, 1820. The violin we offer is ascribed to The Guillami School even though it contains an original Guillami printed label. It is in mint condition and possesses an extraordinarily fine tone. Hearing is believing! Galrao became known as the Portuguese Stradivari. He was not a contemporary but flourished after Stradivari died and spent his time in Lisbon where his work was highly regarded. Very little documentary detail about his life survived; sad but not a loss! What is more important is that a fine and well preserved collection of his instruments exists in Portugal, most notably in Lisbon with The Music Conservatory, The Music Museum and The Royal Collection. This offers a rich collection of authentic examples from which luthiers and historians may make reference. Much of his work that left Portuguese shores subsequently became Italian! The violin we offer here is a fine and rare example dating from circa 1790. It is in very good condition possessing an exceptional sound of many tonal colours and great projection. It is sold with the certificate of W.E. Hill & Sons of London, together with an open letter from Messrs. Blackburn & Peters. A fine and rare Italian violin made by Joannes Antonius MARCHI of Bologne. Machi was a maker who enjoyed a great reputation during his working life in Bologne, which spanned the years 1660 to 1730. He was also responsible for writing one of the first authoritative books on violin construction. This instrument is of medium arching and is made from very attractive woods, with a table which is from a spruce that has fine acoustic properties. The vanish is typical of this maker and is of a honey, light-brown colour. Bearing its original printed label dated 1761, this violin is in a very good condition and has been the principle working violin of a professional musician for many years. In terms of tone, it is bold and cannon-like, but extremely responsive and with a great carrying power. [Sold with the certificate of Etienne Vatelot, Paris, dated 1967, stating that the head is not original, but by a contemporary Italian maker]. BSI are thrilled to offer a spectacular violin of great quality and individuality. Though not quite enough to exhibit the hand of Lorenzo himself, it is very close. The choice of wood, attention to the purfling, the internal workings, plus the varnish are all indicative of solid Neapolitan work of that period. If the violin could speak it may be saying something like this: "I'm a good Neapolitan, well made and with a really fantastic sound. What you see is what you get. Don't mess with me." Needless to say, the tone is truly exceptional! The condition of this instrument is almost mint. An exceptionally fine, modern Italian violin made by MARIO CAPICCHIONI at Rimini in 1987. This beautiful Guarneri copy is in a perfect state and has been the concert instrument of a professional musician for many years [It is sold with the certificate of Eric Blot of Cremona dated October 2002 and is also illustrated on page 177 in the authoritative book on the Capicchioni family by Marcello Villa]. Apart from the superb craftsmanship of Capicchioni instruments, they are renowned for their rich, brilliant yet sympathetic tone and this violin possesses all these qualities. We are offering here another superb violin by the French maker NESTOR AUDINOT. Based on the Guarneri pattern [his most favoured maker] this instrument is in a mint condition and was made in 1914 according to his original printed label and numbered 344[?]. In addition, the interior of the violin has no less then five brands! The tone of this violin should appeal to most players; it is rich, responsive and with great power to tap into when required. NESTOR AUDINOT was born in Mirecourt, France in 1842 and learned violin making firstly with his father Leopold and then with Sébastien Vuillaume in Paris from 1863 until 1868. After setting up by himself for seven years, he took over Sébastien Vuillaume's workshop at 17 Boulevard Bonne Nouvelle on that maker's death. Esteemed as one of the greatest makers in France during the last four decades of the 19th century, NESTOR AUDINOT'S work is of the highest order and quality. Today, his instruments are sought after by players throughout Europe and America. He was one of those magicians who was able to synthesize the finest craftsmanship with the finest of materials to create what every musician is looking for; an instrument which is foremost a vehicle to enable the player to produce a superb sound of great warmth, colour and projection. The violin we offer here is one such example and in our opinion probably one of his finest. Made in Paris in 1880 it is a Strad inspired instrument which is in a mint condition. It is produced from the finest of timbers, both visually and acoustically and covered in a beautiful honey, red-brown oil varnish. We are very privilaged to offer another superb violin from the hands of NESTOR DOMINIQUE AUDINOT. This instrument, influenced by the early work of the great Italian maker J.B.Guadagnini circa 1740, is an example of his finest output, cementing the concept that Audinot was one of France's greatest late 19th and early 20th makers and certainly in the same league as the best Italian contemporaries. Made from the finest of woods, it is covered in a glorious red coloured varnish over a golden ground that simply sparkles and in its texture similar to the varnish of Guadagnini himself. It is gently and artistically 'antiqued'. The violin is in a mint condition and contains its original printed label dated 1904 and numbered 337 and is branded internally in three places on the inner table and inner back. We are pleased to offer, on behalf of a retired professional musician and soloist, an Italian violin made by Nicolo Gagliano of Naples in 1756. The previous owner, the distinguished Argentinian soloist, Alberto Lysy used it for several years as his main concert instrument. This exquisite violin represents the finest work of Gagliano and is in an almost perfect state. The rich velvety varnish is a beautiful warm orange brown colour and the tone of this violin is outstanding. Sold with the certificate of J & Arthur Beare, London. The work of PAUL BAILLY has always been regarded with great respect amongst players and collectors. He was a fast, but truly skilled craftsman and we feel that he was highly regarded as a "musician's maker". There were many players, both in France and in Britain and probably elsewhere, who entrusted their valuable instrument to Mr Bailly, to be copied. We have seen over eight such instruments and are pleased to offer one here which was made for a Mr Vignetie ("Fait pour Monsieur G Vignetie") and is inscribed thus on the printed label. Mr Vignetie's violin was almost certainly a Mateo Goffriller of Venice circa 1740. The Paul Bailly copy was made in 1906 and is numbered '1323'. It is a beautiful violin in mint condition and displays his finest craftsmanship. The varnish is superb and there is a slight hint of 'pink' (typical again of Bailly), particularly on the back. In respect of tone, it is rich and sonorous. The FORSTER dynasty of stringed instrument makers in England consisted of six family makers spanning just over two hundred years. Their output was varied in quality; more to satisfy the demands of the players and the limits of what they could afford and the current desire to have an instrument styled on the instruments made by Jacob Stainer. The lure of London however encouraged three members of the family to establish their livelihood in the capital city, away from Cumberland and the small village of Brampton. Patronage and a good income were available to those makers of merit! WILLIAM FORSTER  was born in Brampton in 1739 and at the tender age of 20 left for London to establish his reputation. He remained in London for the rest of his life, dying there in 1808. Known as 'Old Forster' and sometimes 'Royal Forster' because of his patronage from the Royal family, his status as a fine and honest maker increased to the extent that he was considered one of the finest English makers of his time. We have been commissioned to offer for sale a superb violin by him which bears its original written label dated 1793 and numbered 25. It is in a fine condition. The tone is full and rich over all strings. Another fine example from the South of France, this Franco-Italian violin is in a near perfect, original state and is made from the choicest of wood. The varnish is a fine honey colour and the tone is clear, rich and vibrant. ALBERTUS BLANCHI has used the model of Sanctus Seraphin in this violin. The workmanship is of the highest quality, with a superb scroll and purfling. Albertus Blanchi and his father Augustin, worked at Nice and established this fine school of making which has more to do with the Italian school than the French. Their immediate predecessors were Pierre Pascherel in Nice and his teacher, Pressenda at Turin in Italy. ALEXANDRE DELANOY was born in the famous violin making town of Mirecourt in 1850 and died in Bordeaux in 1928. He became a pupil of Charles Buthod in that town and then went to Paris where he became the last maker to work for J.B.Vuillaume. In 1880 he moved to Bordeaux where he settled for the rest of his life and established a renowned and thriving business. His work is of the highest order, as one would expect, having continued the tradition set by Buthod [who worked for Vuillaume for several years] and Vuillaume himself. This violin made in 1913, as the printed label shows [and numbered 131 on the inner, central back] is a fine Strad copy which is in a mint condition and covered in a superb, deep red oil varnish, a colour favoured by many Bordeaux makers. It is branded 'A.Delanoy' on the inner, top block. The tone is full and rich and easily produced. ALFRED VIDOUDEZ was born in Geneve in 1879 and died there in 1943. He was probably the finest maker ever from Switzerland. He became a pupil of Gustave Bazin at Mirecourt [Bazin was a fine maker who became the best maker working for J.B.Collin-Mezin]. The fine quality of his work was recognised by George Mougenot in Brussels who offered him work for several years and he then moved to Leon Bernadel in Paris. In 1900 he returned to Geneve where he remained for the rest of his life and created an internationally recognised establishment, known for its expertise and quality of work. His son Pierre joined him in 1907. This violin, which is in a mint condition was made in 1917 and represents an example of his best work where the varnish is so beautifully and gently 'antiqued'. It is a Strad copy and has a superb tone. Paul Mangenot (1862-1942) was the first important maker of this luthier family and who became enormously important as a maker. He studied with the wonderful French maker Paul Bailly and supposedly with Justin Derazy and worked for; Collin-Mezin, Joseph Hell (in Lille) and several other makers in Paris, Brussels, Geneve and Lyon, before settling in Mirecourt until his death in 1942. It was in Mirecourt that he established a truly fine, but intimate workshop which produced instruments and bows of the best quality. This included superb reproductions of previously important French makers (all then dead of course!) whose trade mark (brevette) he legitimately bought. They included makers such as Didier Nicolas (aîné), Honore Derazey and Justin Derazey. So faithful to the originals were many of these instruments, that some were later passed off as authentic! Of his three luthier sons (two were sadly killed in the first World War) AMATI MANGENOT, born 1901 was to become a superb maker, his reputation spreading beyond France. He studied with his father and then worked with Albert Laurant in Bruselles. After opening a workshop in Clermond-Ferrand for three years he established himself at Bordeaux, taking over the business of Emile Laurent. His output is exceptional in quality and in particular his faithful reproductions of old Italian masters. The violin which we offer here was made in 1943. It bears its original printed label together with the maker's inked inscription on the inner table. As a faithful copy of a Montagnana of Venice, this instrument glows. It is covered in an artistic, slightly antiqued oil varnish of a fabulous re-brown colour and has a tone of great richness. The work of AMATI MANGENOT appears to be of the highest order and quality and continues the existing fine work of his father Paul Mangenot. This master craftsman used only the finest of materials and finished his instruments in a wonderful quality varnish. We are offering here, once again, an example of his best work, an exquisite replica of a 1607 Cappa violin which is in a near-perfect state. Bearing his original printed label [latinised] dated at Bordeaux in 1927 it has, in addition, a facsimile printed label of Cappa on the opposite side of the interior back. Three of the maker's brands also occur on the interior of the violin. The tone of this violin is responsive, full and rich and with many varied tonal colours to hand. The South of France school of making has produced some outstanding makers over the past two centuries. Charles Barbet & Edmund Granier of Marseille were at the forefront at the turn of the 19th century. Their association began in 1877 and continued until about 1912, having established a fine workshop in the Rue du Paradis, in the central part of Marseille very close to the opera house. The shop is still in existence today. The quality of the instruments that they made were of the highest standard and their reputation rightly increased. This violin, inspired by the Strad model, is an exceptional instrument. The wood is very attractive and the overall craftsmanship almost flawless. The transparent oil vanish is a light red, orange-brown colour, tastefully shaded and antiqued. The sound is responsive, even and with a power that can be tapped into. CHARLES BOULLANGIER is recognised as one of the great late 19th century instrument makers. He was born in Mirecourt, France in 1823 and once his developing talents as a maker were being recognised, he went to Paris and worked firstly for the great Parisian maker Jean Baptiste Vuillaume and then for the house of Gand and Bernadel where he became highly regarded. Things were to change rapidly, however! The French Revolution of 1848 was causing havoc throughout France and in particular Paris, where there were serious riots and business in general being badly affected. So, at the age of 26 in the following year  he left France for good and went to London where he remained until his death in 1888. His first appointment was working for the luthiers Edward Withers where he remained for seven years. Once his reputation increased, he set up his own premises in Frith Street and then Charlotte Street. This 1866 Strad inspired violin is representative of his finest work, showing a remarkable combination of French and English styles. The rich, red-brown varnish, slightly antiqued shows the influence of Vuillaume. The condition is mint and the tone 'superb'. We are always pleased when we can offer an example of the work of COLLIN-MEZIN. Their reputation over the past century and a half has increased considerably worldwide and is considered a good investment, provided the condition is good. This particular violin is rather special. It is a very early example of the personal work of COLLIN-MEZIN pere  and is in a mint condition. The tone is especially fine; rich, sonorous and with a 'well' of sound to tap into. It is sold with the certificate of authenticity from J.J.Rampel of Paris, successor to Etienne Vatelot, the great Parisian expert. Born in Mirecourt in 1875, Emile LAURENT and his brother became pupils of their father. He then worked for Paul BLANCHARD in 1894 and then with Emile GERMAIN in Paris and further with Caressa & Francais until 1908. He then went to America and worked with Lyon & Healy, Chicago, from 1908-1912. He returned to France and set up his atelier in Bordeaux, working with another very fine French maker, Amati MANGENOT. In 1926 he returned to Paris and remained there for the rest of his life. This became a turning point in his career and his work fully matured and was highly sought after. The instrument we offer here represents his finest quality and is a copy of a Guadagnini. We are of the opinion that his greatest examples do in fact follow the Gaudagnini pattern. This superbly made instrument is in a mint condition, with its original bridge, and has an exquisite powerful but sympathetic tone. Highly recommended. Born in 1895 in Piacenza, son of Domenico with whom he learned [a maker of great regard!] Emilio soon attracted much attention through the quality of his work and was awarded a gold medal in Cremona. Another one of those 'no nonsense' Italian makers, who whilst basing their work on classical makers, imbued their work with that sense of individuality. This violin from 1937 uses the Strad design as its basis. It is covered in a straw coloured varnish of considerable depth and the scroll is particularly well cut. This violin is in a mint condition and has an excellent tone. Born in Rome in 1897, the work of BERTUCCI falls into that category of late nineteenth and early twentieth makers whose work is often individual, but extremely well made and never boring. Working in Rome, he produced some extremely good instruments and in 1923 created his own brand [brevet]which became a sort of trade mark and for three years from 1927 worked with Gonzalis Aurelis in Rome. Based mostly on the Strad model, this violin is in a mint condition and covered in a deep red varnish, somewhat similar to the work of Melegari of Turin. Tonally, the instrument has every required quality for a first rate violin, but in particular its great depth. We offer here another Italian violin by FAUSTO MARIIO BERTUCCI [see ref 217 for family details]. This instrument was made in 1923 and bears the maker's printed label together with three internal brands ['F.M.B']; one above the label, one on the top block and one on the interior table. It also bears the number 53 on the inner back. The violin is extremely well made and is in a mint condition, covered in a fine, honey-coloured varnish. It has a rich, open tone of considerable depth and is a violin which would be ideal for the College student or young professional player. GEORGE CRASKE was born in 1795 and died in 1888 and thus spanned almost the whole of the 19th century. As one would expect his output was large, but as a maker he is considered important and at his best his work could be faultless. His instruments are renowned for their tone and can hold their position against instruments of far greater value. We are pleased to offer here a Craske viola of exceptional quality. It is being sold by us for the present owner who bought it from us over twenty years ago. It is in a mint condition and is a truly fabulous example of his work, showing his artistic approach to applying varnish which is artistically 'antiqued'. The tone is full and rich and highly responsive. GEORGE MOUGENOT was born in Mirecourt, France in 1843 where he was apprenticed to George Deroux and after working for various makers went to Liege and finally Brussels where he settled for the rest of his life, establishing a workshop of the highest standard and ever increasing popularity. In fact, this workshop was previously owned by Nicholas Vuillaume whose own reputation was known and respected throughout Europe. Today, Mougenot's work is regarded as being of the finest quality, both for craftsmanship and tone; even those instruments produced in his workshop by his assistants. He was the recipient of many gold and silver awards offered at various European conventions. This Strad copy is in a mint condition and of superb craftsmanship, covered in a fine, honey coloured varnish. The tone has a clear, bell-like quality, but of great depth. This English violin, made by one of Britain's great 20th Century makers, is a copy of an old Italian master and was for many years masquerading as an Italian instrument made by Michel DECONET of Venice dated "17..". This particular violin is an example of his finest work, and as the images testify, it is made from the finest wood and covered in a beautiful oil varnish of an antiqued red, golden brown colour. This violin is in a mint condition. This violin by GEORGE WULME HUDSON was sold by us over a year ago to a player who has now invested in a special Italian violin from us and we are therefore very pleased to offer the Hudson again. This instrument, which is in a mint condition is a very fine and early example of the work of this outstanding early 20th Century maker. Hudson is universally recognised and his antiqued copies in particular are some of the finest in existence. This Strad copy, made when he was 33 years of age, is of the choicest wood and covered in a beautiful oil varnish of a light red-brown colour. Tonally, it is full and rich and very responsive. This violin is a superb Nicolo Gagliano copy by the fine English maker GEORGE WULME HUDSON, completed around 1930. It is in a very good condition and has a particularly good oil varnish of a golden-brown colour and of a texture reminiscent of Neapolitan 18th century varnish. The choice of wood is exceptional, particularly the fine spruce table. In terms of tone, it has a great sonority and power over all the strings. Although this instrument is unlabelled, the maker's small brand 'caressi' can be seen on the upper, interior block. GEORGE WULME-HUDSON is now regarded as one of our finest early 20th Century makers. His work is profoundly artistic. This glorious violin continues the tradition set by John Lott in the middle of the 19th Century of copying a great Master. The Milanese work of J.B. Guadagnini (circa 1740) is clearly the influence and inspiration for this work. Wulme-Hudson has chosen the finest and most beautiful wood for this instrument. In the varnish, he has captured the quality and colour of a fine Guadagnini. The instrument bears its original printed label "GIO CARRESSI FECIT LONDON 1917" which also appears in many of his instruments. It was his nickname, Giovanni Caressi, thought in truth to be the name of a shop in North London, near to where he lived. Gill Solomon is a native New Yorker who trained as a restorer. He came to England in 1968 and soon established himself as a superb craftsman and maker. He has been the custodian of many of the World's greatest instruments, including those belonging to such renown international artists as; Steven Isserlus, Karine Georgian, Sandor Vegh, Szymon Goldberg, Robert Cohen, Uto Ughi, to name but a few. Born in San Remo, Italy, in 1890 Giovanni PANIZZI was a self taught maker who became very much appreciated both in Europe and the U.S. His work is often very individual, but usually one can see the influence of an earlier great maker as a basis for his design. The violin we offer here is attributed to this maker and was made in 1947 and contains its original printed label and signature and inscription on the interior back next to the label. Showing the influence of Stradivari, this instrument is in a mint condition and covered in a fine deep red varnish. In terms of tone, it has a full and rich sound which is easily produced. The BAZIN family of France excelled themselves as great bow makers. GUSTAVE BAZIN, although a trained bow maker originally, concentrated his abilities and efforts into becoming an instrument maker. So good was his work, J. B. COLLIN-MEZIN employed him as his top craftsman for several years. His neat work and use of the finest wood can be seen in this 'cello from the 1890s. It is in an almost mint condition (highly rare for a 'cello of this age!) and has a superb tone. WILLIAM HERMAN HAMMIG was born in Markneukirchen, north Germany in 1838 and was taught the art of stringed instrument making by his father. In 1850 he was working with Carl Grimm in Berlin and for a short period in Amsterdam. In 1864 he returned to his birthplace and a further two years in Frankfort. Finally, he settled in Leipzig in 1875 and remained there for the rest of his life where his reputation and expertise established him as one of the foremost luthiers in Germany. He died in 1925.
pleased to have been commissioned to sell a fine example pictured here. Beautifully made from the finest wood and covered in a glorious red varnish. Sold with the certificate of authenticity from Hamma & co of Stuttgart,Germany. JEAN JOSEPH HONORE DERAZEY was a great French maker whose name has become a household name in France and Britain in particular. He was born in 1794 and died in Mirecourt in 1883. His learning years were spent at various workshops in Mirecourt, but came to Paris where he worked for various makers and eventually for the greatest of French makers, J.B.Vuillaume. His output was extensive, but the quality of his craftsmanship always of the highest order. He gained several honours and medals for his work especially in 1839, 1844 and 1849 and in England in 1862. The violin which we offer here was made circa 1850 and is typical of his work at this period. It contains the maker's original brand 'H.Derazey' on the inner back below the left hand sound hole. It has the broad Lupot-Strad design and made from the finest of woods and covered in a fine light, honey coloured varnish, a shade which he seemed to favour. It is in a very good condition and has a strong, vibrant tone which is very responsive. JEAN COPLERE has produced some very fine instruments and as a modern maker is very much appreciated. His work is traditional and every aspect of craftsmanship superbly worked out. We are happy, therefore, to offer one of his 'cellos which was completed in 1963. It is beautifully made and in a perfect state, covered in a fine and pretty oil varnish of a honey-tan colour. The tone of this 'cello is full and rich and easily produced. JOHN DILWORTH is a flourishing modern, British maker, whose unique work is responsible, in part, for putting British instrument making at the highest, international level. This violin, made in 1997 is a wonderful tribute to the copyist's art. It is a formidable representation of the famous 'Leduc' violin by Guarneri del Gesu of 1743 and once owned by Henrich Szering since 1970. The Dilworth copy is in a mint condition and has superb, beautifully shaded orange-brown varnish with the slightest hint of red. It bears the maker's printed label dated 1997 and is branded on the interior back, close to the sound post and is further branded on the bottom rib below the button. A professional English violinist commissioned this instrument from John Dilworth and was his working instrument for many happy years, replacing his fine French violin by Lupot. The tone is rich, responsive and possessing many varied 'colours'. JOHN JOHNSON was originally sold by us to a professional player over eleven years ago and who has now acquired an old Italian instrument. Lovingly looked after by the previous owner, the condition of the Johnson is almost perfect. John Johnson was one of largest dealers in London and was renowned in particular for his excellent music publishing. His output as a maker was highly esteemed, as well as employing and selling the work of other makers. This Johnson instrument is a typical and fine example of his work, skilfully made and covered in a glorious mid brown coloured varnish of fine quality. The tone has great depth and of considerable power. JULES GRANDJON was born in Mirecourt, France in 1824, learning his trade in the workshop of his father. He then moved to Paris to improve his skills by working with several of the capital's best makers and three years in Amsterdam with Louis Bernadel. He returned to Paris by 1850 and stayed there for several years, before establishing a large and famous workshop in Mirecourt. This Strad inspired violin was made circa 1860 and is a fine example of his personal work, bearing his printed label. It is in a mint condition and covered with his typical varnish of a superb quality, which is gently shaded and antiqued. The tone has a rich sonority which projects well and is easily produced. At the age of thirteen, LEON MOUGENOT began his studies with his father George Mougenot, in Brussels. After working for the famous French maker Paul Blanchard in Lyons and then Paul Jombar in Paris, he removed to London and spent a few years with the World renown firm of W. E. Hill & Sons in Bond Street. In 1899 he returned to France and created his own famous workshop in Mirecourt where it remained operating until the début of the 1950s. A list of some of the luthiers who worked for him, is an indication of the thoroughly high quality and standard of their output. [French] Charles Enel, Max Millant, Rene Jacquemin, Lucien Schmitt, Paul Bisch, Lucien Ragot. [English] Hill. [Italian] Carlo and Leandro Bisiach. The 'cello which we are offering was made in the workshops in 1932 [numbered '274'] and is a supreme example of their finest work. It is in a mint condition and has a resonant, rich tone. LOUIS FERNAND BILLOTTET was a French maker [died 1948] whose work is truly exceptional and equal in quality and conception to many of his Italian contemporaries such as Pedrazzini and Fagnola, etc. He was an apprentice to the great Parisian maker Charles Enel and afterwards set himself up in the same city in the boulevard Bessier. His work is meticulous and stunning and his often red varnish of the finest quality. The violin we offer here was made in the 1920s and is a testament to his finest work. It bears his original printed label which is signed and dated and numbered. In addition it bears his circular brand on the interior back, slightly overlapping the label at the top left-hand side and is further branded 'L.Billotet a Paris' below the label. It is in a mint condition and has a tone of 'soloist' quality. Surprisingly, the work of Luc GALLICANNE is not often seen given he is supposed to have been a fairly prolific maker. Born in 1884 he established himself in Paris in 1923 and worked there for the rest of his life. He won medals at the Geneva exhibition in 1927 -- and rightly so; his work is of the highest quality. The Gallicanne we offer here [numbered '50' on his ornate, printed label dated 1925] is an exceptional instrument which is in a mint condition and has a beautiful deep red varnish of great transparency. Its tone is strong, vibrant and easily produced. It is an ideal violin for an advanced player or young professional. 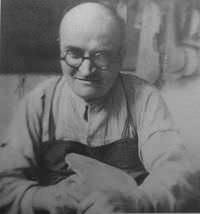 LUIGI PAOLI was born in 1908 and began his working life as a luthier in Naples but then moved to Trieste where he settled and created for himself an increasing, advancing reputation. He seemed to be one of those 'no-nonsense' makers who never seemed to fall into the trap of producing instruments that looked and sounded like 'mutton dressed up like lamb'. His integrity as a maker is shown in the quality of the wood he used and the clear, precise craftsmanship he always adopted. This example, dated 1943 is a Gagliano copy and is in a mint condition and a superb example of his artistic approach. The wood is beautiful and chosen for its acoustic properties, especially the one piece back. Enhancing this is a transparent varnish of a golden, honey colour. The Caussin family of Neufchâteau in the Vosges region of Eastern France, near to the more famous city of Mirecourt, created a distinct style of instrument making, in particular, a quality and technique of varnishing which became highly regarded and influenced many French and German makers. François (born 1793) founded his own premises in 1815 and was assisted by his two sons plus other makers. The eldest son, Nicolas, became the pre-eminent maker of the family and was highly regarded throughout France. Many makers, particularly from Paris, had their instruments varnished by him. [Refer to Page 77 of 'Les Tresors de la Lutherie Francaise du XIXe siècle' for photographs of a violin of the same period by Nicolas]. 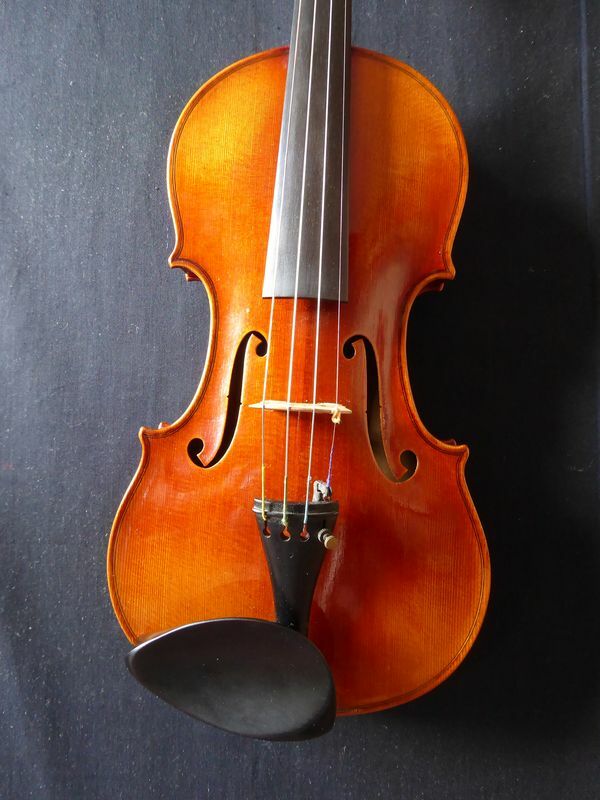 The viola we offer here is a superb example made by Nicola Caussin circa 1860 and is in a mint condition. It is typical of his finest craftsmanship and covered in the varnish which is so cherished. The tone is full, rich and of outstanding quality. Another example from this first class French maker which was made, however whilst he was resident in London. Bearing its original printed label it is dated '1890' and numbered '603', together with his signature and number in ink on the inner back. This copy of a Strad, is in a mint condition and represents his finest work. It is covered in the maker's best oil varnish of a red, amber-brown colour delicately shaded. The tone is exceptionally full and rich. What a fantastic and exciting maker PAUL BAILLY became! From his birth at Mirecourt in 1844 until his death in 1907 he worked in and travelled to, many places throughout Europe. He was a highly prolific maker and believed in the work ethic that 'fast work was good work'. A rather arrogant statement to make for most craftsman, but in his case, it worked. Having been trained by the great Jules Gaillard he went to work for the even greater, world renowned Luthier in Paris, J. B. Vuillaume. In artistic conception, his work is quite varied, but always underpinned by superb craftsmanship. This violin, which is in a mint condition, dates from circa 1880 and is based on the Strad model. Tonally, it is full and rounded and remarkably responsive. PAUL BISCH was born at Mirecourt, France in 1893 and became a pupil of Leon Mougenot. He then worked for Thibouville Lamy and then Caressa and Francais in Paris . Between 1923 and 1929 he had an association with Christian Olivier and finally opened a large atelier back in Mirecourt in 1930. He received numerous diplomas and honours during his working life both in France and Europe. For me, he was one of the finest French makers working during the first half of the 20th century. His work is superb in every respect. Craftsmanship and artistic conception are of the highest order. The violin we offer here combines all these qualities together with a superb, rich tone. It is a magnificent instrument modelled on a Guarneri del Gesu and is in a prefect state. An exceptional and fine French violin made by PAUL BLANCHARD of Lyon, bearing the maker's original printed label dated 1907 and numbered 863, together with his external brand 'PB' on the lower rib below the button. Born at Mirecourt in 1851, Blanchard developed as a maker over the following five decades to become one of the most respected Luthiers both in France and throughout many countries in Europe and the USA. Apprenticed to Darte and supposedly the great J. B. Vuillaume in Paris, he worked firstly with H. C. Silvestre in Lyon between 1869 and 1876 and then established his own workshop in that great city. His reputation increased enormously and eventually became top maker to the Lyon Conservaiore, providing also stringed instruments and bows to the theatres and orchestras of that city. This Strad copy, representing his best work, is in a mint condition and covered in a wonderful, transparent, deep red oil varnish, now so typical of the Lyon school of making. It has a tone of great warm, but with a 'well' of powerful sound to be tapped into when needed. Born in 1906 PAUL HILAIRE served his apprenticeship in the great workshop of George Apparut at Mirecourt in France. On the death of Apparut in 1948, Hilaire became the successor of this workshop which continued to produce stringed instruments of the best quality. The 'cello which we offer here is attributed to Paul Hilaire's workshop [numbered 750] and is a fine instrument which is in a mint condition. It is sold with an original certificate of guarantee from Hilaire. The tone is full and rich. ROGER & MAX MILLANT were brothers who were born and worked in Paris for the first half of the twentieth century and stand out as probably the best makers in that city. Roger was born in 1901 and Max in 1903 and they set up their premises together in 1923 at number 51 Rue de Rome. This street hails as the centre for Luthiers and is still considered the most important area in Paris for that purpose. The shop is still in existence and is now run by Max's son, Bernard. Both brothers were resident in London for a short period, working for Dykes and sons before returning to Paris, where their reputation as makers increased substantially, not just in Paris but the whole of France and Europe. The violin by Roger & Max was made in 1943 [numbered 1073] and is an example of violin 'art' at its very best. It is a splendid copy of a Guarneri del Gesu which is in a mint condition and covered in the most beautiful oil varnish of a red-brown colour. It bears the makers' printed label together with their triangular stamp [rMm] above the label on the inner back. As a playing instrument, it has all the qualities of a fine violin, with a tone of considerable penetration and depth. This Strad copy, made in the workshops of Silvestre & Maucotel in 1903 bears their printed label together with internal brands. The violin is covered in a deep rich red oil varnish. The condition is almost mint and the tone is full, rich and responsive. Silvestre & Maucotel established one of the finest Paris workshops at the début of the 20th Century, joining forces in 1900 and together, with their other talented makers, produced some very splendid instruments until 1913 when Hippolyte Silvestre died. Ernest Maucotel, who was apprenticed to Paul Bailly at Mirecourt, continued for several years in association with Deschamp. SIMON PETERS has produced another superb violin for us! Like many of his personal instruments, we see the influence of the Gagliano family of Naples and in particular that of Nicolas Gagliano. This violin is a faithful copy of Nicola's work and contains a facsimile printed label together with the Simon Peter's brand above it. The craftsmanship is faultless; the choice of wood of the highest order and the varnish truly beautiful and very transparent. In terms of tone, this instrument stands its ground against violins worth many more thousands of pounds. Once again we have pleasure in offering a top quality violin made especially for us by Simon Peters of Brussels. It is a copy of, and inspired by, the work of Carlo Giuseppe Testore of Milan, 1693. The work is both refined and visually stunning, covered in a tastefully antiqued honey coloured varnish of great quality. The tone is rich, strong, suave and with great carrying power. We have acquired another great violin by Simon Peters and believe this to be his finest instrument to-date. Inspired by the work of Nicola Gagliano circa 1760, this instrument is in a perfect state and incorporates the important stylistic features of this great Neopolitan maker, in particular, the purfing. It is made from the finest woods and covered in a glorious brown varnish which is both transparent and artistically antiqued. It bears a facsimile printed label of Nicola Gagliano and is branded "S. Peters" on the label and bottom rib above the end pin. In terms of tone it is simply superb. Priced at £14,000, Simon is willing to reduce this to £12,000 - valid to July 1st 2016, when it will revert to its original value - in the hope that it will go to a good and loving home! Since the publication of Peter Benedec's scholarly book on the violin makers of Hungary, the music world has become gradually educated into accepting that Hungary has produced some World class makers. Standing head and shoulders above most, was the superb late nineteenth, early twentieth century violin maker SZEPESSY BELA. Born in 1856 in Pest he studied his craft with Engleder and Nemassanyi [from 1868 to 1874] both of whom were considered internationally as fine makers. He then moved to Vienna and spent six years there improving his techniques. At the age of twenty five he made another move and spent the next 40years in London, carving out for himself an international reputation. Needless to say, his instruments are highly esteemed. The violin of his, which we offer here and which is the property of a retired professional violinist who has commissioned us to sell it, is an example of his best work. Made in London in 1885 and numbered 19 on his printed label it also has his inscription in pencil on the inner, upper back. It is a beautiful, robust copy of a Guarneri, covered in a superb oil varnish of a rich, red-brown colour. It is in a mint condition and has a vibrant, responsive tone. VICTOR JOSEPH CHAROTTE was a truly artistic French maker whose work is without doubt of the highest quality. He was born in Mirecourt in 1870 and worked there for the whole of his life, dying in that great city in 1925. He had an important professional association for several years with another fine Mirecourt maker, George Apparut. In the year 1900 he was awarded a gold medal at the Paris exhibition. The violin we offer here is a superb example of his work which is in a perfect state and inspired by the work of the 'Marsick' Nicola Amati of 1660. The photos, which accompany this entry, illuminate perfectly the exacting nature of his craftsmanship and beautiful varnish. The tones is rich and vibrant and offering great power when required. Born near to Mirecourt in France in 1884 ALBERT DEBLAYE established a workshop in that town in 1900, which increased in its reputation for producing superb instruments over the next thirty years. Their output produced copies of many of the great makers; Strad, Guarneri, Ceruti, Amati, Lupot, Vuillaume and many more. Everything about a Deblaye instrument is almost without criticism. They used the finest woods and the craftsmanship immaculate, varying the quality and colour of their varnish to match the model that was being copied. The violin we offer here is in a mint condition and bears the original printed label dated 1925 and numbered 1812 together with the 'Deblaye' signature. Covered in a particularly fine honey-coloured varnish, this instrument has a rich and bold tone. The violin is sold with its original 'guarantee' from the Deblaye atelier, bearing the date 1925 and number '1812'. ALBIN HOLLINGER [1875-1911] established himself in Kiel in Germany and worked for the great German luthier Winterling for a period of two and a half years. Albin was one of those superb late 19th century German makers whose work was equal to some of the best makers in Europe, including Italy. The Universal Dictionary of Violin and Bow makers refers with great enthusiasm to his "masterly craftsmanship in all parts". The violin we offer here is a fine example of his work which is in a mint condition and the photos of this instrument clearly show the superb quality of the wood used and the artistic varnish which is gently antiqued. The crowning glory of this instrument is the tone! It is fully rich with a deep "well" of sound to explore and is highly responsive. Sold with the certificate of authenticity from the great German violin house of Winterling in Hamburg. ALFONSO CAPPELLARO of Vento [nr. Venice], Italy, has produced some splendid violins and violas and is considered to be a top-ranking 20th Century Italian maker. His work is cleanly executed and he uses the finest of wood. He uses a soft looking oil varnish, as this viola shows, which is an attractive orange, light red-brown colour. Amédée Dieudonné was born in Mirecourt in 1890 and died there in 1960. He became a pupil of Gustave Bazin and in 1920, after serving in the first World War, he created a small and intimate workshop which continued for the next forty years. During that period he employed many fine makers and apprentices (never more than four to five at any time), notably, Etienne Vatelot. The output from his workshop was always of the highest quality. The violin here was made in 1949 and is a mint condition Strad copy. It bears the original printed label plus inscriptions on the inner back. The brand can also be seen above the label. The violin has a rich and powerful sound of unique quality. JONATHAN WOOLSTON of Cambridge, England is an exceptional maker of great skill. This violin, designed to be played in the Baroque style, is based on an instrument made by Carlo Tononi of Venice in 1725. Woolston has used the finest materials and applied a beautiful red-brown varnish on a tan ground. Any specialist Baroque violinist would be more than pleased with this instrument, which is in a perfect state. If you want to read extra biographical detais of the CAUSSEN dynasty refer to ref 286 in the viola section. highly esteemed in France and now throughout Europe. THe violin offered here is a fine example and showing the hand of Francois [the younger] Caussen. It is in a mint condition and has a tone of quality and projection. Le Lyonnais was born in Nantes in 1892 and worked there for the whole of his working life. He collaborated with another very fine maker, Paul Kaul, together with a Dr Chenantais, who became a renowned expert. Charles became a pupil of Emile Audinot at Mirecourt. This fine French maker is renowned for impeccable craftsmanship and for producing instruments with an essence of individuality in the making. The instrument we offer here is in a mint condition and possesses a truly responsive tone of great quality. For almost a century [between circa 1860-1941] the COLLIN-MEZIN dynasty [father, sons and many fine craftsmen] were responsible for the production of some of the finest stringed instruments emanating from a French workshop. The violin which we are offering here was made during the period overseen by COLLIN-MEZIN JUNIOR [fils] Made in 1926 and numbered 23, it is a Strad inspired instrument which is in a mint condition and possess a rich, vibrant tone. Surviving is the original 'guarantee' issued by Collin-Mezin when the violin was first sold. We are pleased to offer another violin from the great workshops of CHARLES.J.B.COLLIN-MEZIN. This instrument is a particularly fine example which is in a near-perfect state. Based on the Strad model, it has the maker's printed label dated 1922 and is numbered 694 on the inner back, together with the maker's signature on the inner back near to the sound post. As always, the choice of wood is of the highest order and the violin is covered in a very pretty red-brown varnish of excellent quality. The tone is rich and vibrant, even over all four strings and is easily produced. We are very pleased to offer yet another French violin from the prodigious workshops of J.B.COLLIN-MEZIN at Mirecourt. Made during the transitional period [i.e. between father and son] and in the year that the Mézin family received a top medal at the Paris exhibition of 1900 [as stated on their label]. This Strad inspired violin is beautifully made and is in a mint condition. It is covered in a nut-brown coloured varnish of great quality and transparency and the violin has its original printed label together with the original signature 'Collin-Mézin' which is near to the sound post on the inner back. The tone is extremely rich and full and is easily produced, possessing many varied tonal colours. An ideal violin for the good advancing player of Grade 8 to diploma standard. We are very pleased to offer another very fine violin from the workshops of J.B. Collin-Mézin at Paris (Mézin Fils). This instrument created on the Guarneri Del Gesu model is in a mint condition and is dated 1914 on its printed label, together with their signature, on its inner back. They have chosen the most attractive wood for this violin which, in addition, has the highest acoustic properties and, as such, the instrument possesses an extremely rich and full sonority. Another fine French violin by COLIN-MEZIN[jnr] bearing the maker's original printed label dated 1924, signed across the label in ink 'No.80. H extra'. The maker's sigature can also be seen on the interior back to the right of the sound post. This Amati inspired violin is a fine example of his work which is in a perfect state and covered in a rich light brown varnish. The tone is exceptional with a powerful projection. Three generations of the MOINEL family have worked in Paris and Mirecourt since 1850 and have established for themselves a reputation as superb luthiers. The grandfather of DANIEL MOINEL, Francois Moinel, born in 1838, worked for such great French makers as Charles Gand, Emile Germain and the house of Gand and Bernadel in Paris. His ability as a maker was highly acclaimed and this has filtered through his family, down to his grandson Daniel. DANIEL MOINEL was born in Paris in 1901, learning his trade originally from his uncle Charles Cherpital in Mirecourt and then in Paris with his father Charles, remaining and working with him for a few years. After a spell with the house of Maucotel and Deschamps, he set up his own premises in Paris in 1934 and two years later removed himself to the famous luthier street of Rue de Rome (No 45) which is even today as important. The violin we are offering by him here is a bold, Strad inspired example, made around 1935 when he was surely trying to impress Paris. It bears the ornate, printed label of Paul Beauscheur, who was a foremost dealer at the time and who introduced the work of many of the up and coming makers of Paris. On the interior can be seen two of Daniel Moinel's brands and a further one under the button of the exterior bottom rib. This violin is in a mint condition and covered in a very finely textured oil varnish of a deep, orange-red colour. The tone of the violin has considerable power (when needed!) but it is resonant and with a variety of musical colours. We have been asked to sell, on behalf of a client a modern viola made by one of England's top, professional makers. The present owners are reluctant to sell this instrument, since it has a tone that is full, rich and responsive, but the size of the viola has proved a little too large for them. DAVID MILWARD's viola is stylistically his own conception and we feel he has achieved an instrument which is both artistic and acceptable [refer to images]. The wood which he has chosen is visually and acoustically of the highest order. The oil varnish is tastefully and gently 'antiqued' with a texture and patina very acceptable. We particularly like this instrument! £9,000. Etienne DROUIN was a fine and important French maker who worked in Mirecourt between the 1850s and 1890s. He established an exceptional workshop and employed many gifted makers, such as Charles BRUGERE (who he also taught) and his son and successor Charles DROUIN. The violin offered here, made circa 1870, is a superb example of his personal work (with the collaboration of his son, Charles). This Strad copy bears a facsimile printed Strad label together with his script brand "Et. Drouin" below the label. This violin is in a mint condition, made from excellent wood covered with an exceptional amber-orange red varnish reminiscent of a contemporary maker to himself, Jules GRANDJON. The tone of this instrument is equal in power and quality to that of J.B. VUILLAUME! Whilst Paris was the mecca for violin makers since around 1600,it was Mirecourt in the east of France that hosted many makers; they were closer to their source of wood in the Vosges forests. By the 1750s Mirecourt was well established and hosted many luthiers and often offered their instruments as though made in Paris; the reasons are obvious! FRANCOIS PILLIMENT was one such maker who was working there between the 1760s until the 1830s. His son also assisted him and their output, much regarded by musicians, was distributed to many of the cities throughout France. The Philliment violin we offer here is a nice and typical example made circa 1810 and is in a very good condition. Unlike many violins of this period it is not oversized. It has a tone of considerable power and quality and even across over all four strings. It is covered in an attractive amber honey coloured varnish and contains the maker's brand 'Philliment' on the inner back. Another fine example of the excellent work of Franz Koch of Dresden, showing just how superb German work can be. This violin is a Strad copy and is in a mint condition. It has the maker's original printed label together with his brands and is numbered "1-74". The tone is brilliant yet sympathetic and is an instrument ideal for an advancing younger player of grade VII plus. This Strad copy 'cello is in a mint condition and bears the label and brand of EMILE BLONDELET at Paris. The tone is full and rich and would be a suitable instrument for an amateur player or young cellist of grade VI plus. Born in 1891 in Basel, Switzerland, FRITZ BAUMGARTNER was the first important maker bearing that family name. The quality of his work progressed significently and by the 1920s had gained an international reputation. This violin, dated 1937 and bearing the maker's original printed label is a very fine example of his work, exhibiting all the definitive and essential qualities of a well made instrument. The wood is really well chosen, especially the stunning one piece back and all covered in a beautiful oil varnish of a light, amber-honey colour. In terms of tone, it is full and rich and resonant and partly because of the gentle arching, has a great reserve of power to tap into. The violin is in a mint condition. GEORGE APPARUT was born in Juvaincourt [near to Mirecourt] France in 1877 and died there in 1948. His formative years as a luthier were spent with several of best known French and Belgium makers such as Paul Blanchard in Lyon and the great George Mougenot in Brussels. At the beginning of the 1920s Apparut set up a workshop in Mirecourt, having both his sons working with him and two makers of enormous repute, René Cune and Paul Hilaire. The workshop remained small and intimate and dedicated itself to producing some of the finest stringed instruments in France at that period. Recognition of his 'art' was expressed in the atelier winning many international prizes and medals including Paris. Looking at an Apparut instrument one sees dedication to craftsmanship and the use of the finest woods both for the visual and acoustic properties. This violin represents his top work. It is a copy of an old Italian instrument by Sancto Seraphin and is indicated thus on the original printed Apparut label. The violin is in a mint condition and covered with a stunning deep red oil varnish [Apparut is noted for the high quality of his varnishes]. The tone is 'bell like' but of great depth. GEORGE CONE continued the traditions of the Lyon school of making in France, which over the years since the 1880s has become very much regarded. Born in 1877 Cone was a pupil of Durant at Mirecourt and then in 1896 with Paul Blanchard at Lyon. He continued working for Blanchard until 1912, then worked in various workshops abroad. In 1928 he returned to Lyon where he took over the workshop of Emile Boulangeot and continued producing fine instruments there, helped by several good makers. In addition he was appointed Violin Maker to the Lyon Conservatoire and the 'Association Philharmonic de Lyon. en 1932' ['made in the workshops of George Cone of Lyon in 1932']. Typical of the Lyon school, it is an instrument of superb craftsmanship and has that wonderful red varnish. The tone is full and rich. The Withers name represents a great violin making dynasty in London, flourishing from the 1760s to the late 1980s. George Withers worked for over 50 years from 1878 and became known as one of the finest luthiers in London. He had two sons, Guarnerie and Walter, both of whom trained in Mirecourt, France. The violin which we offer here is attributed to one of the sons, probably Guarnerie. It is in a mint condition and in style shows the influence of French making. It bears its original printed label of 'George Withers'. It has a full, rich and responsive tone and would suit an advancing young player of Grade VI or higher - or a good amateur player. The great firm of JEROME THIBOUVILLE-LAMY in Mirecourt, France were producing stringed instruments and bows for over a century and at every level from the beginner to the professional player. They were an international company whose products were sold throughout the world and in particular Britain, where they had a great outlet in London. The 'cello offered here bears their special brand 'Nicholas Duchene' on the interior back of the instrument and indicates that it is an instrument intended to be played by an advanced, young player; an instrument capable to be used to Diploma standard and even beyond. It is made from attractive wood, covered in a mid-brown coloured varnish and is in a mint condition. The tone is very responsive and with a well of power which can be tapped into. JACQUES CAMURAT was born in Madrid in 1927, but worked almost all the rest of his life in France, firstly with Paul Baur in Angers. In 1947 he removed himself to Paris and worked for several years in the workshops of the great Parisian and international expert Vatelot. The violin which we offer here, was made in 1957 and is a fine testament to just how great and sympathetic a maker Camurat was. The crafting of the whole of this Strad inspired violin is of the highest order and it is covered in a beautiful soft, light, red-brown oil varnish which simply glows. It is in an almost perfect state and has a rich, vibrant tone of great quality and resonance. Another fine example of the work of JACQUES CAMURAT, who although born in Madrid in Spain in 1927, he moved and settled in Paris when he was twenty years of age and remained there until the early 1950s. His work and position in France was highly regarded and he did a great deal to enhance the position of Luthiers both in Paris and Mirecourt. This violin, which is a Strad copy bears his printed label from Bilbao in northern Spain and dated 1952, suggesting that he had returned to Spain by this time. He certainly worked in Madrid for the remainder of his working life. This instrument is in a mint condition and an example of his first rate craftsmanship. He is particularly noted for the quality of his varnish which is well applied and has a soft, oil appearance, no doubt helping the quality of the violin's tone. JAMES RAWES is amongst one of the best makers in the UK at the moment! This violin which we are selling for a professional player, was made in 1997 and is a particularly fine example of his work. The quality of the wood chosen is exceptionally high. Every part of the craftsmanship is without criticism and the varnish a transparent, light, honey-brown colour of great quality. It has a tone of depth and resonance, which is produced with ease, responsive to any bow requirements. Jean Paul Fritsch was born in France in 1910. He became apprendiced to Amidee Dieudonné at Mirecourt and later to Charles Enel in Paris. Whilst in Paris he worked for Paul Serdet for several years, before setting up his own premises in 1934. This violin, made in 1947, exhibits all the great qualities of this truly superb craftsman and is in a near-perfect state. The tone is full, rich and bell-like. John Wilkinson was born in London in 1889 and remained there for the rest of his life. He was advised by George Wulme-Hudson to study violin-making with Thomas Holder. During the First World War he fought at the battle of the Somme in 1918 where, unfortunately, he sustained serious injury to his left hand. Despite this, and with the invention of a T-shaped iron stabiliser, he was able to continue making to the highest standard. Apart from his career as a maker, he was probably the last of a very long line within the 'outworker system', stretching back to the 17th and 18th centuries, a system enjoyed by key figures such as Peter Walmsley, Richard Duke, John Betts and the Forsters and many more. As an outworker he worked for George Withers of Leicester Square and J & A Beare from 1938 until his death in 1961. The violin we offer here is an exceptional example of his work. Made in 1915, it is a rare example where he uses a written label. Inspired by the work of the 18th Century Gagliano family of Naples, it is in a perfect state and made from the finest woods. It is covered in a beautiful golden coloured varnish. The tone is full, rich, vibrant and very responsive. William Tarr was an English maker residing in Manchester in the north of England during the 19th century and is regarded as one of finest maker of double basses. He also produced other stringed instruments including violins. He was helped by his two sons for many years. Shelly, the youngest son worked with him for many years whilst Joseph, the eldest son remained with him until 1900 when he emigrated to America. He was considered a very fine maker, particularly of violins. The violin here is the work of JOSEPH TARR made in 1888, two years before he left for America. It is in a mint condition and contains his printed label dated 1888 together with an inscription on the inner table and several ink stamps. The tone is wonderfully rich and powerful and full of interesting qualities and extremely responsive. If there are instruments by Joseph of this quality in America, post 1900, then they are very lucky! The beautiful little town of Chaumont in the Haute-Marne [near Champagne] in France was the home for over twenty five years of the French maker JOSEPH VAUTRIN. Born in Mirecourt in 1875 he became apprenticed to Chipot-Vuillaume and then went to Paris to work for Emile Germain as his top maker. He died in Chaumont in 1937. The work of Vautrin is highly regarded. Craftsmanship is always of the highest order and the wood which he uses is certainly chosen for its beauty, but in particular for its acoustic properties. The varnish is another strong point of his conceptions; always transparent and of a superb quality. The tone of this Strad inspired violin is vibrant and 'bell-like'. Please refer to ref 251 which is another violin by JOSEPH VAUTRIN and contains all the biographical details of this fine French maker. LEON BERNADEL was the last maker of the great luthier family of BERNADEL, which started around 1790 and continued throughout the nineteenth century and first half of the twentieth. Born in 1853 in Paris, Leon worked with other members of his family and also for Honore Derazey and Gand. In 1914 he became a director of the great instrument making house of Cousenon and acted as the head of the stringed instrument making department. He still continued to make and was responsible for the output of their best production know as the 'Monopol' range, played mostly by professional players. This 'Monopol' violin dates from 1922 and is in a perfect state. It embodies the best of French making. The label is dated 1922 and it is numbered 209, together with several brands on the interior. It is a Strad copy, covered in a deep red oil varnish, redolent of the quality seen on the instruments of Gand & Bernadel of Paris. The tone has great sonority and depth, but with excellent projection. This famous French workshop, under the direction of Leon Mougenot, produced instruments of the finest quality. Leon was the son of George Mougenot who had established himself in Brussels as a very fine French/Belgium maker of international fame. Before settling in Mirecourt around 1899 to create his own workshop, Leon worked both in Lyons and Paris and even spent a few years in London working for the great firm of W. E. Hill & Sons in Bond Street. This violin, which is a Strad copy, is in a mint condition and covered in a light, honey-brown coloured varnish. The tone is powerful, expressive and very even across all the strings. LEON MOUGENOT was born in 1874 and served his apprenticeship with George Mougenot in Brussels [this was the first cousin of his father, Joseph Mougenot] from the age of 13 until 1894. He returned to France and worked in Paris and Lyon and a year in London with the Hill Family . In 1899 he established his own workshop back in Mirecourt which expanded over the years employing some of the best makers including a member of the Hill family and Carlo and Leandro Bisiach from Italy. His output was of the finest quality and much sought after in Europe and the United States. We offer here one of his best violins! Made in 1913 it is inspired by the model of Peter Guarneri and is in a perfect state. The choice of wood is exceptional and is covered in a typical 'Mougenot' varnish, just lightly antiqued. This violin is an exceptional example from the LEON MOUGENOT workshop. Considering that it was made during the second world war, when resources were scarce and the movement of people highly restricted, this violin is astonishing. The choice of wood is superb, whilst the crafting of the violin flawless. It is covered in a beautiful rich red varnish, gently antiqued on the once piece back. The tone is 'bell like' and of great depth. Sold with the certificate of Vatelot/Rampal of Paris 2010. MARCELLUS PIERRE ROBIN was born in Moulis [a sleepy, beautiful little town near to St.Giron in the Pyenees region of France] and then moved to Bordeaux in 1905 where he became a professional bass player in addition to setting himself up as a luthier operating a small workshop employing a few important makers. He remained there for over 22 years, enjoying an ever increasing reputation. This violin, made circa 1925 is a joy to look at and play! It is a copy of a Domenico Montagnana of Venice from circa 1750 and is in a perfect condition. He has used the very finest of materials and produced an instrument of great beauty, covering it in an oil varnish of a deep red-brown colour. It bears two of his signatures, one on the inner back and one on the inner table. It has a tone of great strength and projection. Mittenwald in Germany has been the bed-rock of stringed instrument making for many centuries now and has produced some outstanding makers and indeed families of makers. Names like Klotz, Hornsteiner, Neuner, Jais and Kriner come to mind as some of the best. The name of Seizz [also spelt 'Seitz'] represents another family of great making tradition, though less well known in Britain. Michael Seizz worked in Mittenwald in the early part of the 19th century and was a highly regarded craftsman. He often worked for other makers, which is why we do not see his individual examples so often. However, we are very pleased to be able to offer a violin by him, which represents his finest work and which contains his original, written label dated 1823. This beautifully made violin is in a mint condition and shows his preference for the Strad model. The wood is carefully chosen and the varnish a stunning, light honey-brown colour. Tonally, the instrument has great strength and is highly responsive. Another fine example of this famous French maker's work, made in the last year of his life in Paris. Despite being made in his 63rd year, the violin shows no sign of a diminishing talent. The design is based on an older Italian instrument and is probably a copy of a violin belonging to one of his clients. It is in a near-mint condition, with a minor, top rib repair. The tone is of considerable strength but with a certain mellowness. We are pleased to offer this superb English viola on behalf of the present owner. Paul Collins' reputation for fine work is well established. This example is in mint condition and has a generous tone which is easily produced and very vibrant. Paul Mangenot was born in Mirecourt in 1862 and eventually settled back in Mirecourt, dying there in 1942. During the interim period he worked for several great French and Continental luthiers, including Colin-Mezin in Paris, Joseph Hel in Lille and others in Brussels, Geneva and Lyon. He legally bought the trade brands (brevette) 'Honore Derazey' and 'Didier Nicholas' and with his fellow workshop makers produced superb copies. Those of Derazey were often so good they have since been designated as originals and certified as such! The violin we offer here is a Derazey copy, circa 1925, and is in a perfect state. CHARLES RESUCHE & JUSTIN DITER worked as a partnership in Lyon, France for ten years from 1890 until 1897. Both makers came from a sound and professional background as luthiers both in Paris and Lyon. Resuche worked in Paris at the great house of Gand and Bernadel whilst Diter, having been taught by Paul Bailly went to Lyon and worked for Blanchard. The work of Resuche and Diter is typical of the Lyon school of that period as is this violin which is in a mint condition and was made in the final year of their partnership. It contains their printed label. RICCADO BERGONZI is one of Italy's finest modern makers. Born in 1961 in Cremona, he can trace his family back six generations to the great Carlo Bergonzi who worked in that same city and was a pupil of Stradivari. He made his first violin at the age of twelve. Later, he and his brother were accepted as students at the World renown violin making school at Cremona. Studying with Stefano Conia, he graduated in 1979 as 'the best pupil of his year' and was immediately asked to become a teacher at the Cremona School where he remained until 1990. He has won many medals for his instruments. The violin which we are selling was made in 1995 and is in a mint condition. It is a beautiful copy of a Guarneri del Gesu and contains the maker's original label and named 'Egisto Naponi' together with his monogram in ink. It has a most wonderful tone that can be compared favourably with many older Italian instruments costing huge prices. We are pleased to offer another fine French violin from the great Parisian luthiers SILVESTRE & MAUCOTEL [see Ref: 111 for historic details]. This Strad copy made in the same year as our other violin by Silvestre & Maucotel  and numbered 496 on their printed label together with internal brands is in a good condition and a typical example of their best work. Covered in an oil varnish of a red-brown colour, the violin has an excellent warm tone of considerable projection. SIMON PETERS is a young maker of stringed instruments. He comes from Belgium. He lives in Brussels. He frequently visits London and he is also probably one of the finest living makers in Europe and beyond! Because of his profound craftsmanship and a personal admiration for instruments of the Gagliano family, we commissioned him to make a copy of the Nicola Gagliano violin mentioned on our web-site [Ref: 168], which belonged to the international soloist Alberto Lysy. The result is astonishing! An instrument has evolved which encompasses every essential aspect of a fine violin. All measurements, thicknesses and general weight are perfect. He has used the finest wood and the varnish of such superb quality, which has been applied with artistic skill. The tone is rich, vibrant and with a fine depth. We have commissioned SIMON PETERS and his workshop in Brussels to create for us specially, violins of outstanding craftsmanship and tone. They are all made entirely by hand and varnished by Simon himself from a recipe which he has perfected over several years. They are set up with the best quality fittings and strings and represents extraordinary value at £8,000. We are pleased to offer three examples, two of a personal/Strad model whilst the other is inspired by the work of the famous 18th Century Italian maker, Testore. Two superb examples from the hands of Simon Peters, these violins are based on an Italian instrument by Carlo TONONI. They contain a facsimile printed label of that maker, both dated 1728, and several brands of Simon Peters plus an external brand on the bottom rib, above the button. These violins are stunning, particularly the magnificent wood used in the backs and the beautiful honey coloured varnish which is gently and artistically antiqued. All the above is matched by a tone that is full, rich and of great clarity. STEFANO CONIA is considered as one of Italy's top modern makers, working in Cremona and we are pleased to offer, on behalf of a client, this superb violin which was made especially for them in 1998. It is an almost mint condition and is sold with the maker's original certificate. The tone is full and rich with a mature quality of sound. Thomas James Holder was born in Wales in 1874 and went to Paris in 1913 where he worked until 1929. His craft is highly regarded both in France and Britain. Most of his violins are inspired by the Strad model. This violin is in a mint condition, bears its original printed label and is branded internally in several places. Of particular beauty, is the rich deep red-brown varnish. It possesses an extremely fine tone which is rich, powerful and responsive. Victor AUDINOT, better known as Victor Audinot-Mourot, was another fine French maker of the Audinot family. Born in Mirecourt in 1870, it wasn't until 1913 that he set up his atelier in Paris where he worked with several of his sons. Between them they produced exceptional stringed instruments. This violin, made circa 1915, represents his best work. In mint condition, it is inspired by the work of J.B. Guadagnini of Turin, circa 1780. Victor has used the finest of woods, delivering both acoustic and aesthetic excellence. The varnish is of a beautiful transparent honey colour. It contains its original written label and is numbered '231'. In addition, the maker has inscribed his details in ink, on the interior back, opposite the printed label. This violin has an exceptional tone which is vibrant, responsive and easily produced. The late nineteenth and early twentieth century in Britain produced some exceptional makers. WILLIAM ROBINSON who worked in London at the début of the twentieth century was a well respected luthier whose work was generally very neat. Nearly all his instruments are covered in a fine brown varnish and he used excellent materials. The instrument we see here is Strad inspired and is in a mint condition. It contains the maker's printed label dated 1934 and numbered 318, together with his signature. In terms of tone and as a direct result of using fine acoustic wood, we have a violin of considerable richness and projection. An ideal violin for that advancing player of Grade VI and above or for the good amateur player. The firm of WOLF BROTHERS in Germany, were operating during the last quarter of the 19th century and first quarter of the 20th century and were distributing their stringed instruments throughout Europe and the United States of America, but in particular, the British Isles. The production that they offered were of the finest quality. The violin which we are offering here represents their best work and is a Strad inspired instrument. It was made in 1888 [numbered 201] and is in a perfect state. The tone is full and rich and with supreme projection. AMEDEE DIEUDONNE was born in Mirecourt in 1890 and became apprenticed to Gustave Bazin, where he fulfilled five years work. He then moved to Brussels and worked for Darche and finally to the great Parisian maker Emile Germain, where he perfected his skills for a period of about six months. The period of the first world war inevitably put a stop to his working, as he became an active French soldier, winning two medals and five citations. Returning to Mirecourt at the end of the war he established a small workshop that was to become, probably the best of its kind in that town. Many apprentices and luthiers passed through over the years and were to become fine, if not, great French makers in their own right. This violin, which dates from circa 1928 is in mint condition and is a typical product from Dieudonne's atelier. It is beautifully made, using the finest woods and covered in a golden coloured varnish of superb texture [a hallmark of a Dieudonne instrument]. This Strad inspired instrument has a rich, resonant tone. A superb small 3/4 size[large 1/2 size?] French violin made circa 1946 probably from the atelier of Amédée DIEUDONNE. It is inspired by the work of Joseph GUARNERIE and bears a facsimile printed label of that maker, dated 1741. The wood chosen for this instrument is of the finest quality, both visually and acoustically, and it has a very attractive one piece back. The violin is covered in a fine quality varnish of a rich, light, red-brown colour. The tone is exceptional! It is fully rich with a reserve of power to tap into when required. A very good German violin of the BERLIN SCHOOL, probably from the workshops of AUGUST REICHERS circa 1860. A copy of a Carlo Bergonzi, this instrument is in a mint condition and covered in a fine amber, light-brown coloured varnish. We consider this instrument ideal for a younger player of Grade VI plus standard. This BOHEMIAN violin, dating from circa 1870 and from an unidentified workshop is a very good instrument based upon the work of J.B.Guadagnini of Turin. It is in a mint condition and made from the finest of materials with a particularly handsome one piece back. The varnish is a rich red brown colour on an amber ground and very tastefully antiqued. An ideal violin for the Player of Grade 5 and beyond and with a rich, vibrant tone. This violin is from a well known workshop headed by Bruno Rugemer established in the German town of Nuremberg. Their output was prolific and the craftsmanship always very refined. This AMATI inspired violin is in a mint condition. It is an ideal instrument for a player of Grade IV plus. The Caussin workshop began its auspicious career around 1840 in Neufchateau. It is only today that we recognise the superior quality of their instruments. In this particular violin we notice the hand of Francois Hippolyte Caussin (the younger). It is a copy of a Francesco Ruggeri of 1671 and is thus labelled. It is a violin of great beauty being made from the finest materials and covered in the honey coloured varnish typical of this family. The instrument is in a mint condition, extremely well made and has a rich, vibrant tone with great carrying power. CHARLES BAILLY, a good French maker of the early twentieth century used on occassions, another name than his own; a sort of 'nom de guerre'. Here we have a violin, which is in a mint condition and a Strad copy and which bears a printed label 'L.Berard 1931'. This name was registered as a copyright name by Charles Bailly and used in many of his instruments. In addition, there is another printed label on the interior back 'Lutherie Artistique, entierement fait a la main avec de vieux bois', which indicates that the violin was made entirely by hand and of old wood. Dating from 1925 this good French violin represents quality work from the workshops of COLLIN MEZIN jnr. It contains its original printed label and orignal signature in pencil on the inner back. Based on the Nicolas Amati model, this violin is in a very good condition. The wood used is of the highest possible quality, especially the back which is very attractive. 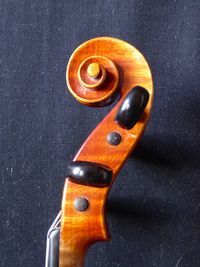 Unusually, the violin has been 'tropicalised' [tiny ebony pins inserted at all four corners both back and front] indicating that it was intended to be used in a country where the weather is indeed, tropical. Further evidence of its intended destination appears on the printed label, which states, in the form of a stamp, 'made in France'. The tone is rich and full, with great resonance and equal over all four strings. The great French workshop of J.B. COLLIN-MEZIN at Mirecourt was at its height during the last quarter of the 19th century and first of the 20th century. Stringed instruments of the highest quality were sold in France and Britain and as far afield as America and Canada. In Great Britain the main distributor was Hawkes & Sons [later to become Boosey & Hawkes] who also were the sole agents for the work of Pedrazinni and Fagnola from Italy. Few people are aware that in addition to Collin-Mezin instruments being offered with their usual labels and signatures, they produced a special series which were all copies of the J.B.Vuillaume style and were thus labelled. Originally conceived as a slightly less expensive range, they nevertheless lacked none of the skilful workmanship expected of that workshop. We are pleased to offer one such instrument which is in very good condition and is made from attractive wood with exceptional acoustic properties and covered in a fine varnish of a transparent, golden-brown colour. The tone is rich and vibrant and with a large reservoir of sound to tap into. An extremely good modern viola by this well known English maker. Based on the Strad model, the viola is made from the finest of wood and thus, possesses an excellent tone. It contains the maker's written label dated '1992' and numbered 151 together with the maker's brand 'D.P. Plowright' on the outer, bottom rib. This is a particularly good English instrument made circa 1830 of the LEEDS SCHOOL, being in a mint condition. Typical of the style of instruments made by these makers, this violin in particular shows the influence of MARK DEARLOVE. The varnish is a fine light orange-brown colour in its original state. The tone is particularly strong but sympathetic. Geronimo Barnabetti was believed to have been a maker who worked alone before joining the great French firm of Thibouville-Lamy. The name 'Barnabetti' was used by that firm for many years for their standard quality instruments. This violin, a Strad copy in mint condition, contains their original printed label. Its tone is clear and with considerable projection. Daniel, Barbet and Granier were three makers who worked diligently at the end of the nineteenth century and early twentieth in Marseilles and helped to distinguish that city as an important centre for Luthiers. Their workshop, which is still a luthiers, is in the Rue Paradis, literally around the corner from the Opera house. The Granier family were particularly good makers. The two sons, Andre and Martin studied with Brugere and Bazin in Mirecourt and were thus very well trained. This violin, made in 1932 was produced in the workshops when Martin was in charge. It is representative of their work and is inspired by the Strad model, being in a mint condition. Another very good French viola made in the workshops of THIBOUVILLE-LAMY at Mirecourt circa 1880 which is in a near perfect condition. Based on the Strad model, from attractive wood and covered in a honey, orange-brown varnish, this is an ideal instrument for a player of Grade VIII plus. concern with outlets in Paris and London and distributed throughout the World. Quality at every level was their aim, from the cheapest student instrument to one fit for a top proessional player. The violin here, made circa 1880 is in a mint condtion and an ideal instrument for the advancing younger player of Grade 5 standard and above. Notice the handsome maple back with light bird's eye figuration. JEROME THIBOUVILLE LAMY was, until its closure in the late 1960s one of the largest and most prodigious instrument makers in France, existing for over 200 years. With large workshops in Paris and Mirecourt (and a large outlet in England) it was particularly esteemed for the high quality of its stringed instruments. It employed and trained many young makers, several of whom became directors of JTL and their names used for their best products. Names like Buthod, Acoulon and Blondelet were becoming highly prized. We offer here a beautiful violin labelled and branded EMILE BLONDELET and dated 1932. It is in a perfect condition and has a superb tone. The wood is of the highest quality and the varnish beautiful! Made in the great workshops of Laberte at Mirecourt, France circa 1930, this good violin bears the maker's printed label 'D.Soriot'. This label was applied to their middle quality instruments, intended to be used by advancing young players or amateurs with limited funds. This particular violin is inspired by the Strad model and is in a mint condition and covered in a fine, honey coloured varnish. The choice of wood and craftsmanship are of the highest order and the tone vibrant and responsive. Another fine example from the French workshops of LABERTE at Mirecourt. Although this violin bears an original printed label from Caressa & Francais [stating: 'Fait sous le direction of Caressa & Fraciais' etc] it was made in the Laberte workshops and represents their better, general work. The Strad model is the underlying influence in its design and the violin is produced from the best quality materials and covered in a fine varnish of an amber, honey colour which is lightly and tastefully antiqued. The violin is in a mint condition and would be very suitable for an advancing younger player of the standard of about Grade 5 and which would be ideal to see them through to Grade 8 and beyond. The tone is excellent! Bearing its original printed label of 'L.H.F' and an artistic, elaborate design of a Lyre, this violin is again from the LABERTE workshops when it was know as 'Laberte-Humbert Freres', originally founded in 1919. This Strad copy is in a mint condition and even though it was conceived as a less expensive instrument, there is no evidence at all of inferior work or craftsmanship. Covered in a good varnish of a straw colour with a hint of red, this instrument has an exceptional tone. Yet another very good example from the workshops of LABERTE at Mirecourt made around the 1920s. It contains a facsimile printed label of Carlo Bergonzi of Cremona 1741 and represents an example from their range known as 'copie d'auteurs anciens'. Again, this is an instrument which is of the highest order and is in a mint condition. A very suitable violin for Grade 5 plus, young advancing player. LABERTE-HUMBERT. It is dated 1936 and numbered 7194 on its printed label. It is also sold with the original certificate and guarantee dated 1936. The craftsmanship is of the highest order and the violin is in a mint condition. Covered in a very fine honey coloured oil varnish, the instrument has an enormous sonority which is easily produced. This is, in our opinion, an ideal instrument for the up and coming young player of Grade VI and upwards. Leon BERNADEL headed, for many years, the violin department of the workshops of COUESNON in Paris. This violin is probably by the hand of BERNADEL himself. Inspired by the work of Stradavari this instrument is in a mint condition. The craftmanship is exceptional and the wood has been chosen for its fine visual and acoustic properties. The tone is rich, vibrant and very responsive. Bearing a printed label CARLO STORIONI, CREMONENSIS, FACIEBAT followed by the date, these violins have been misrepresented over the decades. Many people have thought that they were buying the genuine, Italian article. There were several sold at auction which fetched excessive prices, indicating that the Italian myth still persisted. Several experts over the decades thought that they were the product of the famous Munich workshop of Rieger and Fiorini, probably because of the refined craftsmanship of the instruments. In fact, they are probably the product of a superb Markneukirchen workshop, who distributed them entirely to a British concern, who subsequently inserted their 'registered' label. This example is in a mint condition and is dated 1911. The wood is of the highest quality and the craftsmanship impeccable, covered in a fine quality, light brown varnish. The tone is rich and full and very resonant. The great Mittenwald violin making firm of NEUNER & HORSTEINER were flourishing for well over 100 years, producing stringed instruments of all qualities. They created a style of making unique to the Bavarian School, basing their instruments mostly on the Strad design. Matius Neuner was himself a great maker, having worked in France for several years for the unique maker J.B. Vuillaume. He brought back to Mittenwald all the refined skills he had learned in Paris. They always used the finest acoustic wood and in most cases a rich red varnish which was never too 'glaring'. This violin dating from the 1870s is an example of their finest work and is in a mint condition. It bears their printed label 'Matius Neuner......1833'. The tone is extremely rich and responsive and an ideal violin for the advancing player. We would even go so far as to suggest that in terms of tone, a professional player would be more than happy to play on this violin! The work from Neuner & Hornsteiner is invariably of the highest quality. The example here, inspired by the work of Strad, is a particularly fine example. It is in a mint condition and covered with a beautiful light red-brown varnish so typical of their instruments. Tonally, it is superb! It has vibrancy an extraordinary richness that is easily produced. RIEGER AND FIORINI were flourishing between circa 1889 to 1912 and a little beyond. It was created by Giuseppe Fiorini [1861-1934] one of the great late nineteenth century Italian makers, when he moved to Munich in Germany. Andreas P. Rieger, an extremely fine maker in his own right, became his partner as well as his father-in-law. Thus, the famous workshop of RIEGER & FIORINI was created! In 1912[?] prior to the outbreak of the First World war, Fiorini left and went to Zurich and finally returned to Italy. Instruments emanating from this superb workshop are considered to be some of the finest around and offer an equal alternative against those emanating from the best of the French ateliers. Always made from the finest woods both visually and acousticly with usually stunning one piece backs and a varnish, again of an exceptional quality and a rich red colour on a golden ground. Beare & Sons of London were the main distributors of their work in Britain [the logo BSL can be seen often on the printed labels]. And here there is a possible element of humour in the way these were labelled, either by BSL of London or the Fiorini workshop. Those labelled 'Paolo Fiorini' suggest a Turin origin! No such maker existed and they were certainly not made in Turin. However, the middle name of 'Rieger' was probably Paul [he was known as Andreas.P.Rieger]. The use of the name Fiorini however, seems obvious. Those labelled 'Andreas' were probably using the first name of Rieger! The violin we offer here is thus labelled and suggests 'Firenze 1899'. It is in a mint condition and offers a spectacular tone, rich and clear. Robert Adams of Lincoln has produced a fine copy of a Pressenda of Turin, 1823, using European spruce and maple. This well made violin which is in a mint condition is sold with the certificate of authenticity from the maker. This violin easily produces a rich tone. For sale on behalf of the current owner. A very good German school of the SAXON SCHOOL made circa 1860 being in a mint condition (bearing its original fingerboard which is in good condition). 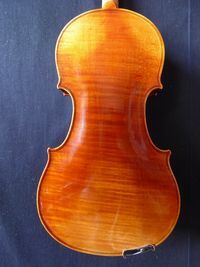 A Strad influenced violin, it is covered in a good transparent amber coloured varnish. IMPORTANT NOTICE. We would ask that you read about our 'Buy Back Guarantee'. We try to carry a varied stock of student violins to suit every pocket, ranging from £500 to £2,000. We purchase only those instruments which are in a near-perfect, mint or near-mint condition and each is set up with the best quality fittings. Petite violas of quality are few and far between. We are especially pleased, therefore, to offer one which was made by Amédée Dieudonné. The condition is mint and it is covered in a beautiful rich, red varnish. The tone of this viola is remarkably powerful and rich. What a little beauty! This half-size violin (a large half-size) is an superb example of North German work (Dresden School) dated circa 1890. It has a glorious, gently antiqued varnish of a rich, red-brown colour. Inspired by the work of Stradivari (bearing a facsimile, printed Strad label). Made from top quality wood of effective and pretty markings, this violin is in a mint condition and has a rich and responsive tone. This Strad copy, made circa 1880, has a small repair on the table and is an excellent violin for the young player. £850. The famous workshops of JEROME THIBOUVILLE LAMY at Mirecourt in eastern France had produced instruments of every description for over a hundred years. They were considered the best producers of stringed instruments at every level. Always perfectly made. Here we have a very pretty violin which is a copy of a Nicolas Amati. It bears a printed facsimile label of that maker. Made from the most attractive of woods it is covered in a lightly antiqued varnish. The tone is surprisingly full, rich, strong and easily produced. This violin from the workshops of MIROSLAV TSONAY in Sophia, Bulgaria is an exceptional example of mid European work which is in a perfect state. The choice of wood is excellent and the varnish a very attractive light, red-brown colour. The tone is full and rich and very responsive. A nice example of the Neuner workshop in Mittenwald, made circa 1840, which is in an almost mint condition. £1,800. A mint condition student instrument from this famous German workshop. Ideal for a young player requiring their first good full-size violin. A Strad copy in mint condition. A modern German violin, a Strad copy, in a mint condition. £850. A mint condition Strad copy from a Slovak workshop, ideal for a student up to Grade IV. £750. IMPORTANT NOTICE. Please read about our 'Buy Back Guarantee' as it applies particularly to customers purchasing a small size instrument. Again, we endeavour to offer a varied selection of top quality small sized violins. The ones listed below are in a near perfect, mint or near mint condition. All represent the highest level of quality and set up to give the best possible tone. A near perfect condition Strad copy. £1,500. George BUCKMAN was a dedicated and good English violin maker, working at the latter part of the nineteenth Century and early 20th Century. The violin we offer here is a unique instrument. It is a child's violin (1/8 size) made in 1878 bearing the maker's original hand-written label. It is in a mint condition with an exceptional tone. Individually made instruments of this size are exceedingly rare, particularly if they are in a mint condition. A very fine 1/2 size violin made in the workshops of JEROME THIBOUVILL-LAMY at Mirecourt circa 1920. 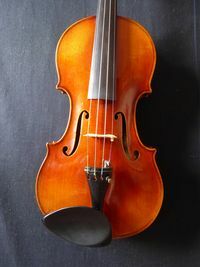 This violin is an example of their top quality work and is a copy of a François Breton bearing their printed label dated 1828 and the Breton brand on the button of the upper back. This violin is made from the finest wood with a superb one piece back of attractive markings. The varnish offers a rich light red-brown colour and the instrument is in a mint condition. Three quarter, French, Labert workshop, mint condition - a very pretty violin. £1,400. Three quarter, French violin, workshop of J. Thibouville-Lamy, made circa 1890. Mint condition - another pretty violin. £1,500. In a near perfect condition, a copy of a "Breton". £1,300. A near perfect half size French violin, Strad copy. £1,200. Mint condition half size violin, Mirecourt School. £925. A mint condition half sized Mirecourt violin labelled "El Maesro". £800. Three quarter German violin made in the workshops of Neuner & Hornsteiner, a Strad copy in a very good condition. £1,400. A GROOVY 1/2 size violin for the aspiring young rock violinist! We have commissioned ADRIAN RAMOS, a notable London artist to produce something different; a piece of musical art that is unique. We have given him a Stentor 1/2 size violin and instructed him to create a one-off. The result is stunning! The violin is in a mint condition. We intend to let him loose on some full-sized violins which will all be totally individual and as they are produced, will be put on our website. In addition to the older instruments recommended for students (up to about grade VIII standard), we are delighted to offer hand-made instruments from two of the finest workshops in China. The images, where shown, give a good indication of their high quality. We choose them for their exceptional craftsmanship and choice of wood, many of which are made from European wood (Balkan maple and Italian spruce) and also the use of a superb oil varnish, tastefully antiqued. They are finished and set up in our workshop with the finest fittings, strings and materials, in order to offer a sound of the highest quality. Indicative price range: £600 - £2,000. Indicative price range: £700 - £2,000. Indicative price range: £1,600 - £2,800. Another superb example of a hand made cello from one of the best Chinese workshops. This Strad copy is in a perfect state and made from the finest wood and covered in a rich red-brown varnish. The tone is deep, rich and easily produced. £3,000.